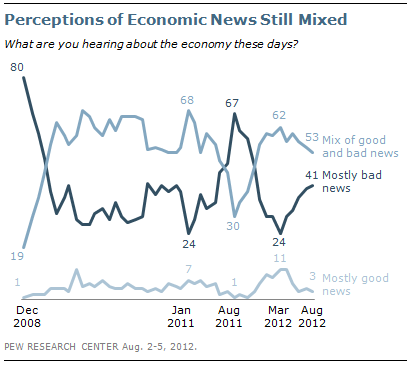 Public views of economic news—both overall and across most sectors—are little changed in recent months. Today, about half of Americans (53%) say they are hearing a mix of good and bad news about the economy, while 41% say they are hearing mostly bad news and just 3% say they are hearing mostly good news. The latest national survey by the Pew Research Center for the People & the Press, conducted August 2-5, 2012 among 1,005 adults, finds that perceptions of economic news are relatively unchanged from July. However, this represents a rise in the proportion hearing mostly bad news about the economy from earlier in the year, when the unemployment rate dipped. Currently, 55% report hearing mostly negative news about the job situation. As with economic news overall, public perceptions of news about the job situation are more negative than they were in March of this year but more positive than they were last August. months. Today, a 54% majority reports hearing mostly bad news about consumer prices, up from 45% in July. Assessments of news about gas prices have worsened since June, mirroring rising costs the pump. About six-in-ten (58%) now say they are hearing mostly bad news about the price of gas; in July—following a drop in gas prices—just 31% said this. But the percentage hearing mostly bad news about gas prices remains lower than the 85% who said this in March, as gas prices were climbing. In recent months a growing number of Americans say that they have been hearing bad news about financial markets—currently 41% say this, up from 29% in March. But this is much lower than last August—following the debt ceiling standoff—when 69% said they had been hearing mostly bad news about the financial markets. And public perceptions about news of the housing market have been steady over the course of 2012. Currently, 41% say news about real estate values is mostly bad, nearly identical to the percentage saying this in both March and July (39%). Perceptions of economic news continue to differ across party lines, and these partisan divides have grown larger in recent months. Today, six-in-ten Republicans (60%) report that they are hearing mostly bad news about the economy, while 38% say the news is mixed and just 1% say it is mostly good. By contrast, just 31% of Democrats say the economic news they are hearing is mostly negative, while 60% say it is mixed and 6% say it is mostly good. A majority of independents (54%) also say they are hearing a mix of good and bad economic news; 40% say they are hearing mostly bad news and 2% say they are hearing mostly good news. 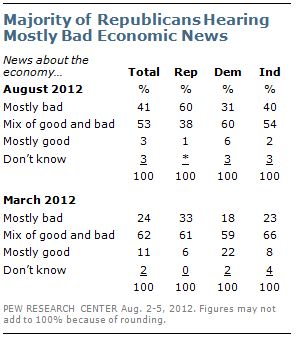 In March, majorities of Republicans, Democrats, and independents reported hearing a mix of good and bad economic news. Over the last five months, the percentage of Republicans who report that economic news is current mostly negative has grown 27-points (from 33% to 60%); by comparison, the increase in those who say the news is mostly negative among Democrats (13-points) and independents (17-points) is less pronounced.